Dati kapag napadaan ka sa mga high foot traffic locations especially sa mga malls naku real estate agents for sure will come near you and will tell you, “Sir/Ma’am, good investment po…” Ngayon siguro nilalayuan na ang mga ahente pero ang ibang mga Filipino nowadays kapag narinig na ang word na “investment” natutukso, minsan sa maganda o sa poging ahente, minsan naman natutukso talaga na bumili o mag-invest sa condominium. I’ll just share here my experience in owning a condo, the focus of this article is more about the ownership and less about it as an investment. I also included here some details of my property for the reference of interested readers. I bought my unit in September 2011 kahit wala pa talaga akong alam. Narinig ko lang ‘yun “daw” kasi ang “in” sa mga OFWs and millennials, maganda “raw” as an investment, mura “raw” kahit nasa prime location. So in short umasa lang talaga ako sa mga information na narinig ko sa iba then I bought it. Alam ko marami ring tulad ko nakinig lang din sa iba at nagpadala. But I didn’t just based on those information alone coming from other people, I also did my research—though after I bought my unit. Yes, it’s WRONG to do your research AFTER you put your money into something but at least I still did my due diligence to validate all the information I received. Another thing I did wrong was, I bought my unit even in fact that I wasn’t really sure if my finances really can afford it. Sometimes ito yung dahilan kung bakit maraming hindi nakakatapos ng pagbabayad, sometimes ito rin yung dahilan kung bakit nasisira ang finances ng mga bumibili ng condo and worse nagbebenta na ng palugi kapag ‘di na talaga kaya. So, after I bought my unit I tried to do some research to validate all the information I’ve had from different resources. Makati CBD where my property is located has the highest average land value compared to BGC and Ortigas City. Residential vacancy rate was only ranging from 10% (2011)–11% (2012). And during that time there was already a downtrend in bank loan rates. 2Q2016 Validation of Research: Makati CBD still has highest average land value compared to other prime locations. Vacancy rate remains at 10% though forecasted to go up to 12%. Bank lending rate currently at the lowest range (refer to the graph below). Though unfortunately, I have read that the rent is expected to go down in the next 12 months by 4% to 7%. Salcedo Village, one of the country’s most progressive residential areas right at the heart of the premier financial district of Makati. and Salcedo Village has low susceptibility to flooding. One of the biggest players in the fast-growing vertical development sector of the real estate industry with over 50 mid and high-rise towers across the country’s most progressive business districts. April 2016 Update: Actually I was not really impressed in the architecture of the condo, but the project was actually highly commended in the held Philippines Property Awards 2016 in two categories namely Best Mid-Range Condo Development (Metro Manila) and Best Residential Architectural Design. Personal Note: Though if you just check all other developments from other developers during the same time this project was offered, you can see better developments. My key takeaway in this development now is just where it is standing right now—Makati CBD. “Research” will be your best defense against the common risks of real estate investing. I suggest, research at least about: the real estate market, the location, the location hazards, the developer, the development/architecture. Developer’s representative was keep on changing, total of six (6) different account officers from 2011 to 2016, kaya medyo ang hirap makipag-coordinate sa mga issues/concerns kasi yung mga sumusunod na representatives maybe kailangan pa nilang reviewhin ‘yung mga previous correspondences I don’t know. Mabagal, in general, ang response nila sa emails. Kahit na siguro naiinis na sila saken baka kaya ayaw nila akong replyan I’m their client, it’s their responsibility to properly coordinate to their clients and promptly respond to their queries. June 2016 Update: The developer already revamped its website showing more recent construction updates of their different projects. I just hope recent and future buyers could rely on that. Personal Note: I have seen a better reporting practice from another developer where they use drone to video construction progress and post them in YouTube. Construction was expected to begin by the first half of 2011 and its completion is expected by the second half of 2014. Announced completion was revised to December 2014. Revised turnover was 4Q2015. But my unit was only turned over in June 2016. The Unit: Though not much that I’d wish to be changed actually but I prefer the angular wash basin same as what been shown sa 3D floor plan (used in websites), ‘yung actual pabilog na kasi. Then, the tiles used also in the bathroom is brownish (taupe gray-ish) but the 3D floor plan shows something light in color. Dark color tends to absorb light so it makes the bathroom looks smaller. 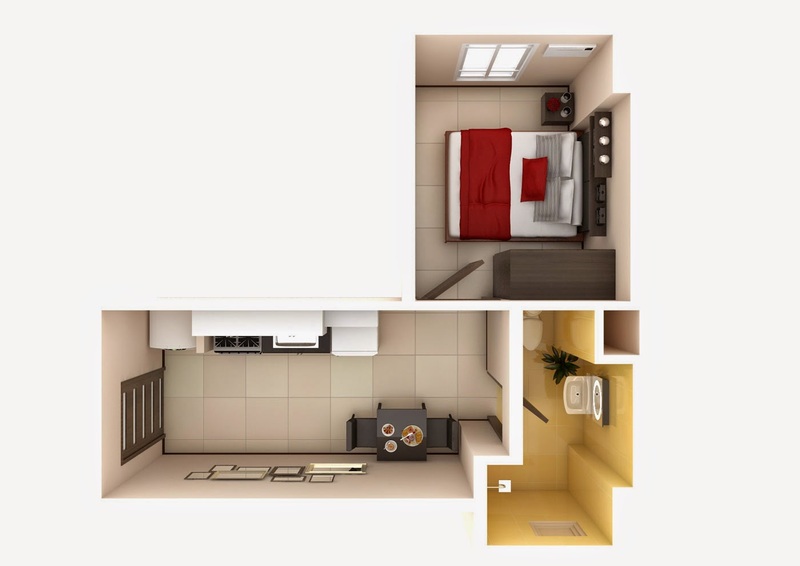 Another is, the floor plan shows only one structural column that will coincide with the space of the bedroom pero ‘yung actual naging two structural columns* na ‘yung nasa loob, so planning how the bed and the cabinets will be placed became difficult and my original plan needed to be changed. And I don’t know whether the photo shown below* meets standards and if this is absolutely safe. The provision for the aircon is located above the provision for the TV. * : These items have been already highlighted to the developer. November 2016 Update: The developer said the highlighted additional column is just a box up and the provision for aircon and tv is accepted and been used in other developments—I’m disappointed.